Red sand dunes are set against an endless sky of indigo blue. At night the Milky Way envelops a seemingly untouched land. This book deals with three geographically discrete groups of people generally referred to as ‘Bushmen’ or ‘San’. The controversial debates on naming are well known (Gordon 1990a) and need brief mention here. The politically correct terms are ‘San’ in South Africa and Namibia and, in Botswana, the official naming is ‘Basarwa’ (singular ‘Mosarwa’). I will however use the clan names of the communities with which my students and I have been working, e.g., Ju/’hoansi (pronounced ju-twan-si), ≠Khomani and !Xoo. Often those who call themselves ‘Bushmen’ or ‘Boesmanne’, do so as a form of resistance against the politically correct externally imposed naming (Bregin and Kruiper 2004: 52-5). San is derived from a Nama word, meaning bandit (Barnard 1992: xxiv, 8; Hahn 1881: 3), while Saa means ‘to pick things up’ or forage. It is in this context that I will occasionally use the term Bushmen. Single quotes indicate where I am distancing myself from such use. The Kgalagadi Transfrontier Park spans both South Africa and Botswana. It features endless rolling dunes with shrubby vegetation and isolated tall savannah thorn trees. The semi-desert is interspersed with numerous pans, ranging from small to well over 50 kms in diameter. 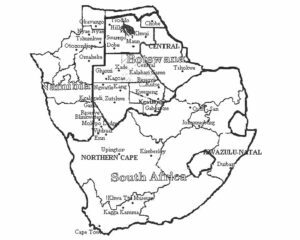 The communities with which we worked resided in three locations, Ngwatle in south central Botswana, Witdraai and Blinkwater in the Northern Cape, and the Nyae Nyae, Eastern Bushmanland, Namibia. Ngwatle was a community of perhaps 100 plus displaced people in 1995, with over 184 in 2004. It is located in the controlled Hunting Area called the Kgalagadi District 1 (KD/1). 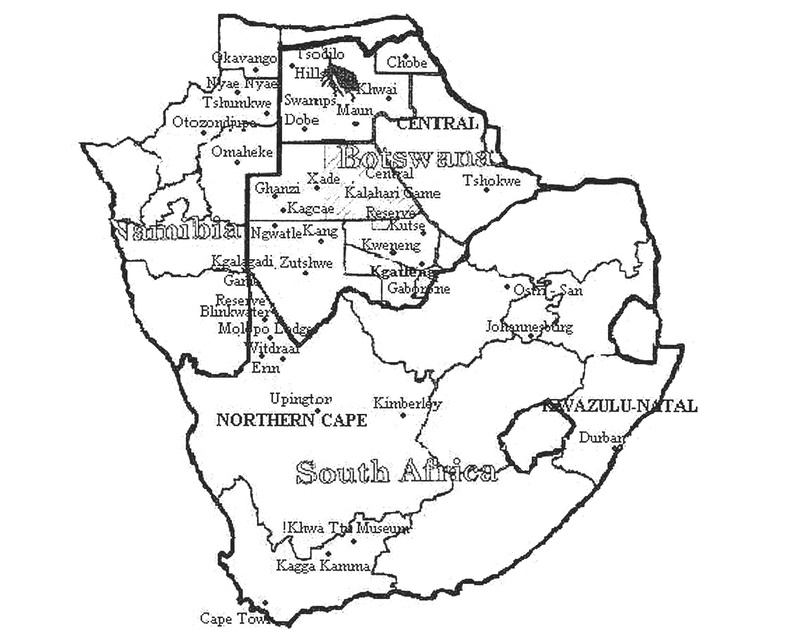 KD/1 is 13,000 km squared and three villages within its boundary include Ngwatle, Ukwi and Ncaang. It has a total population of about 800. In 2001, the villagers told us that the number had risen to 200 plus, the majority being inkomers (newcomers/incomers) mostly of Kgalagadi origin. The !Xoo are the majority at Ngwatle during hard times, but sometimes become a minority in good periods of rain. Ngwatle is living on borrowed time: the villagers have been told to move to other settlements, as the area is reserved for wild animals. Their response is one of resistance, a refusal to move, and requests to publicize their plight. Ngwatle consists of two main ethnic groups: The !Xoo and the Bakgalagadi, although the !Xoo typically build their shelters away from the Bakgalagadi. The Ngwatle Basarwa community comprises a mixture of Bakgalagadi and !Xoo who have defined themselves as Bushmen. This small group coalesced around two Afrikaans-speaking !Xoo brothers in the late 1980s (Simões 2001a). In moving from ‘here’ (Durban) to ‘there’ (Kalahari Desert), CCMS researchers and students had to rethink their research assumptions, identities and even their understanding of cultural studies. The research team’s respective journeys have positioned us, at different times, as insiders and outsiders, as heroes and villains, and as reporters evaluating the said in terms of the more usually unsaid. The complexity and tensions of relationships in Kalahari research is extraordinary, given the relatively small numbers of ‘Bushmen’ who are subject to the intense Western gaze (by researchers, NGOs, film makers, journalists, writers and photographers, many of whom serve audiences of hundreds of millions). Indeed, the nature of this kind of research can be seen as a passage through difficult and scantily known rapids, despite the volumes of published work on specific communities. But in another sense, the passage is more that of a group of individuals with divergent positions, interests or aims, researching together and establishing a consensual position on which their differences may be resolved or accommodated (Shepperson 1998: 348). How do we, the researchers, apprehend, write about and agree or disagree on our observations, interpretations and explanations, and how do we negotiate these with our hosts? When the first draft of Chapter 7 was circulated for comment, the responses were striking, ranging from outright anger from one NGO-consultant to empathy from most academics, researchers, development workers and those who have had long associations with the ≠Khomani. A few of our often marginalized ≠Khomani sources were ecstatic as it seemed to them that they had finally found a team of researchers who perhaps understood their frustrations, hopes and fears, and who were able to communicate these in understandable terms. We spoke to ordinary people, and to some who had married into the clan. Each engaged with us on our objectives and we on theirs. We soon realised that research encounters are often rearticulated by some of our informants into discourses of begging, poverty, hunger and complaints of exploitation at the hands of journalists, photographers and researchers (especially amongst the Kruipers of the Northern Cape). We further sensed palpable relief from such correspondents that someone was at last critically examining development politics and research ethics, and engaging practices previously conducted in relative silence. Coming in from the cold (to Tomaselli, if no-one else), a few of these individuals started to write, dictate on tape, and e-mail him their own stories about themselves and their relations with ≠Khomani personalities, researchers, writers, video producers, and all manner of visitors. One or two expressed feelings of liberation as they no longer felt ‘trapped’ within their insufferable ‘own experiences’, some excruciatingly painful, and others extraordinarily heart-warming (cf. for example Bregin and Kruiper 2004). The unpublished stories are both horrific in their implications, and revealing in their stoicism. They had a sense of an emergent and empathetic community of researchers with whom they could do business, and to whom our correspondents could relate their frustrations, fears, and discontentment. But for obvious reasons many of these stories have to remain part of the hidden transcript, the unsaid contingent upon the community and the resolution of its participants. ‘Paradigm fundamentalism’ can easily occur if a scholar remains locked into the research programmes or theoretical structures inherited from preferred theoretical canons. Hidden transcripts, or at least their effects, tend to be suppressed by researchers because they are messy and get in the way of theory. In this kind of situation, students begin their assessment according to a canon provided a priori through the prescribed and recommended readings of various courses. What makes it specifically ‘fundamentalism’ is when the scholar either: (a) decides that items excluded from the canonical list ought not to be read; or (b) seeks to enrol with the consensus-making apparatus that establishes the ‘canonicity’ of prescribed and recommended readings. During our research period some scholars and films became persona non grata as epistemological battles were waged over legitimacy of interpretation (cf. Wilmsen 1989; Wilmsen and Denbow 1990 and responses to them; Barnard et al. 1996; Marshall 1996; Biesele and Hitchcock 1999; cf. also Gordon 1990b). When you visit Africa, be careful. It is an extremely dangerous place: you will lose your soul to it forever. When we arrived at dusk at Ngwatle in July 2004, we saw a 4X4 sporting the sign, ‘The Jesus Film Project’ (JFP). A number of locals were dancing on the sand to religious pop music blaring from two loudspeakers. Later that evening, five missionaries from Kimberley screened an evangelical film to approximately fifty villagers who had braved the bitter cold. It was much like passing an old-time drive-in as Mick Francis and I returned to Hukuntsi to collect two of our party who had arrived there by car. The next day, we visited the JFP missionaries who told us that they were hoping to make the Bushmen into the Children of God. Far from losing their own souls to Africa, the missionaries were hoping to claim new ones to an indigenised kind of Christianity. The dangers confronting JFP, they told us, were witchcraft, immorality, and Satan. Our own concerns, however, were water, fuel, and time. We learn that a different organisation, ‘Serving in Mission’ (SIM), had set up a large semi-permanent camp at Ngwatle, with the aim of translating the Bible into Sesarwa (a generic of !Kung commonly spoken by the !Xoo/Basarwa of Botswana). Their camp was, however, deserted for the week we sojourned at Ngwatle. We wonder whether these messianic initiatives will have any development implications for Ngwatle. Will jobs be on offer; will Ngwatle perhaps become more permanent, lessening the threat of removal, resettlement, and the destruction of their sense of community? Only time will tell. – offer some passing comments on how media globalisation impacts Third and Fourth World societies, and how local ontologies are articulated into notions of ‘science’, ‘conservation’ and ‘preservation’ (Chapters 5 and 6). 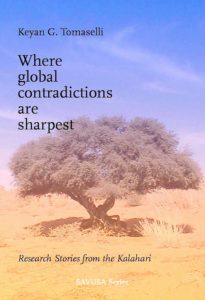 – argue for an approach to cultural studies in Africa which starts from the signs and codes of Africans themselves, one which critically engages Western thought shops which impose themselves on local discursive contours in complete disdain for, and/or ignorance of, indigenous ways of making sense, coping and doing. For me, post-millennium cultural studies largely conjure up images of highly educated, extraordinarily articulate scholars at work in their offices, often over-theorising their arguments, and conversing via well-rehearsed exquisite performances in air-conditioned First World conference environments. Amongst these are a few academic celebrities who charge high appearance fees on the conference and lecture circuits. These are the ‘scholarcrats’ of the international ‘academocracy’ who often pour scorn on fieldworkers who write about their research experiences in terms of arrival tropes, environmental hardships, and basic survival in remote and often dangerous places. As will become clear, the grassroots informants of many of these now generalized presentations and books also want payment and royalties, recognition for the knowledge they have imparted. Belinda Kruiper commented, for example, that without Ouma Una!, the linguistic studies of the ≠Khomani language would be nothing (25 July 2001). ‘Ouma Una! is now dead and has lost control of her knowledge’, lamented Belinda. How knowledge is recorded, archived and copyrighted is a key element of our field research. How it is used and abused is also a pertinent question. Who gets to own indigenous knowledge and benefit from it is of concern to both informants and researchers. When selecting students to visit Ngwatle Pan in south central Botswana, I make it known from the outset that the temperatures are extreme, sometimes sub-zero at night and early morning in winter, and 40 degrees plus Celsius during summer days. And when the wind blows it is extremely unpleasant at any temperature. Scorpions and snakes are ever-present, though malaria has receded. Students are informed that the nearest primary clinic from Ngwatle is 47 kms away, between one and three hours drive, depending on the condition of the tracks. Our food and water intake depends on the number of vehicles in the convoy, and getting there could take two or three days driving time. The water ration, whatever the season, is only five litres a day (for washing, drinking and cooking). At this point the less adventurous drop out, realising that five litres is less than a single flush of a lavatory cistern. Moreover, there are no lavatories where we are camping. The wind. One of my research assistants, a student in Afrikaans literature, told me about the wind. Formerly a physiotherapist, Nelia Oets has spent a lot of time in the Kalahari Desert on photographic safaris. I have also spent a lot of time in the desert. I had not previously experienced the wind. We woke to the wind on 8 July 2001, at Ngwatle Pan. It was unremitting, it was uncomfortable, it destabilised our tents, and blew away some of our camping items. It swept the campfire’s flames onto two of our camp chairs, our only luxuries, and burned them to cinders. Caleb woke in his tent staring up at the moon – which should not have been visible. He had to retrieve and tie up his flysheet with his bootlaces. He later remarked about my requirements that everyone bring spare laces. Nelia had warned us about the wind. Nelia’s warning, together with the experience, reminded me of two other references to the wind. The first was by Paul Myburgh, whom I had interviewed on People of the Great Sandface (1989). He talked about the wind as some kind of existential and elemental force, listening to the desert speak (Myburgh 1989; cf. Gordon 1990b). Belinda Kruiper revealed a similar description to us in August 2000. Both descriptions have spiritual connotations, ‘It’s the ancestors speaking’, we were told. The !Kung whom Elizabeth Marshall Thomas (1959: 126) met in the 1950s, called the spirits of the ancestors the ‘kwe be ha ki’ (‘person who is not here’). ‘These spirits travel in the wind – not the open, blowing wind, but in whirlpools’, which living people try to avoid. Perhaps someone who is no longer here inhabited the wind that blew Caleb’s flysheet away in 2000? When our long-standing friends, Johannes and Baba (Kort-Jan) Nxai, joined us at Ngwatle, we asked them about the wind. They just complained about the cold, the discomfort, and asked us to give them warm jackets. This chapter continues on from Chapter 2. The same characters appear. Some new ones are introduced. I am again concerned with methodology rather than ethnographic description, with the nature of relations between observers and observed, and with problematising relations between observers. We agreed to take Kort-Jan and Johannes to the hunting grounds at Masetleng Pan three hours drive away. But they did not hunt, their dogs were sick, and they did not have their pampiere (Afrikaans, archaic ‘paper/permits’). Previously they could hunt in terms of quotas. Now they had to have their papers as well. ‘Jag met pampiere’ (‘hunting with papers’), is how they referred to hunting after 2000. Paper is exchanged for meat. Both are in short supply, due to the pampiere limitations on quotas, species, and seasons. [i] So we went sightseeing, or so we thought. In fact, they wanted to reminisce about what once was, what might have been, and what could still be, should they be allowed to return to the Pan, and if the borehole could be fixed. We followed gemsbok, blue wildebeest, impala and ostriches at the pans, watched the ungainly poue (Kori Bustards), and talked about camels, which the Trust introduced to the area for tourists. We’d never been to the hunting grounds before in only one vehicle. Usually two are necessary in case one breaks down. The first time, April 1995, Rob Waldron’s Land Rover had overheated. This was its second engine. He sold his vehicle shortly thereafter. Being stuck in the middle of nowhere is a scary experience. The second time, June 1999, Waldron videoed a hunt sequence with Kort-Jan and Johannes. Kort-Jan told us that God gave him the jackal. This time we had two hunters with us who couldn’t hunt – no dogs, no permits, and no motivation. So we discussed life, land, and lien. We returned without mishap to Ngwatle later that day. Kort-Jan and Johannes relived their memories of Masetleng Pan, where a now derelict borehole had once serviced their site. We photographed the remains of the installation, and ate berries from nearby trees. They took us to another of the campsites where Johannes had helped the contractor, Keith Viljoen from the Hukuntsi Trading Store, to build. We climbed up the hide and looked into the distance, surrounding us on all sides, the pan to the south, and trees, shrubs and grass to the north. I remembered being here in 1995, just after Waldron and //Huru!ka (Petrus) Nxai had hunted a bat-eared fox. This was the Pan where Conrad Steenkamp had found some Stone Age flints. (Botswana World Tourism Day poster, 27 Sept 1999). July 12, 2002. The armed guard at Makro, a giant wholesaler in Durban, was wearing a bulletproof vest. We were doing our last minute shopping. I’d never seen a guard in-store before. During apartheid, unarmed, mainly black guards, would, on entry to a store, politely and gingerly search customers’ bags for bombs, guns and grenades. Nelia Oets, already in Upington, 1200 kms to the northwest, called just before my group left Durban. She had been mugged and had hurt her ankle, and might have to cancel her participation. This was serious as Nelia’s 4X4 was crucial to the trip. We arrived at the Upington Protea Hotel, owned by Mary Lange’s brother-in-law, 24 hours later. Nelia had called us by mobile phone earlier. She was on her way to the Molopo Lodge, her foot in a brace. The next morning in Upington I filled up with petrol. The attendant told me to lock my car. A local gang was casing us. A retired couple at the Molopo Lodge 200 kms north mentioned to us later that they had been targeted while at an Upington supermarket. The receptionist at the hotel in Upington mentioned the busload of Taiwanese tourists who had recently been held up, Ned Kelly style, on the Maputu corridor highway. Two white members of our party complained of being closely shadowed by a security in-store guard: no one was above suspicion. At the supermarket a newspaper vendor insisted on pushing my trolley. He refused to loosen his grip until Vanessa McLennan-Dodd and I had unpacked its contents into the Sani. He was allowed to sell papers at the front of the store provided he prevented trolley theft. Stolen shopping was usually taken to the lokasie (‘location’ – black dormitory area near Upington) where there are few shops, where most of the working class, poor, and unemployed live. While clinging onto the trolley, the vendor vigorously shooed away the odd beggar and other would-be helpers/assailants/muggers. Not a policeman in sight. I bought a Sunday Times from the vendor in gratitude and paid off the ever-watchful car guard. In the newspaper the ‘Careers’-section reported that the Western Cape was experiencing a recruitment boom, though hiring was flat in the other eight provinces (Sunday Times Careers 14 July 2003: 1). Maybe Upington, in the Northern Cape, was at the epicentre of this flatness? When we got back to the hotel, ready to leave for the Kalahari, we learned that Marit Sætre, an MA-student from Norway, had become violently ill. It must be the soapy water, we thought. She explained that the four Norwegians registered in our Programme in Durban during 2002 periodically succumbed to a 24-hour tummy bug. In the future, I’ll not make fun of First World students whose overseas doctors tell them not to drink the (very clean) Durban tap water, eat the salad, or forget their malaria pills. So we left Charlize Tomaselli and Lauren Dyll with Marit at the Hotel, which offered them free lodging. Both later complained of having been accosted by drunken white men in the streets during broad daylight. Vanessa and I drove on to Witdraai, two hours north on tar, where we were to meet Nelia, graduate students Linje Manyozo and Tim Reinhardt, Damien Tomaselli and Sherieen Pretorius, who had arrived there on the 11th. Charlize reported that Marit was admitted to hospital that afternoon. The hospital demanded R1,000 in cash up-front for the ward. The manager refused to accept Marit’s Norwegian medical insurance, her father’s card number, or my gold card and ID-numbers, which I phoned through from the Lodge. Wealth before health! Or, perhaps the fear of Marit not settling her debt was as great as was the fear of the vendor losing a trolley? A matter of degree perhaps? Eventually Charlize persuaded the hotel to advance the hospital’s charge. The hospital obviously had little understanding of how to deal with international visitors or global insurance companies, in an otherwise remote province, which prides itself on its unique tourism attractions. The relation between knowledge and the visual, on the one hand, and knowledge about peoples on the other, is a prime concern in visual anthropology. The impact of the visual on the everyday life of the Ju/’hoansi is my concern here. 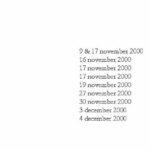 The results of a field trip in July 1996 to Otjozondjupa (previously known as Bushmanland) in [i]Namibia, are discussed in terms of the question, ‘How do subjects make sense of the anthropological?’ Our ‘subject community’ was the Ju/’hoansi of Nyae Nyae. The ‘texts’ we interrogated via Ju/’hoansi popular memory were those made of them by documentary filmmaker John Marshall, South African feature film director Jamie Uys, and a documentary made for the Discovery Channel. – science tried to ‘conserve’ the Other in museums, in film, photographs and video, in body through mummification and even in the field itself. Rob Gordon (1985) calls this ‘death by conservation’. However, a third avenue characterized by postmodernity, has collapsed the modernist distinctions between science and priest-craft. The respective narrators of Dancing at the future (Stander 1996) and The art of tracking (Discovery Channel 1996) have, as I will argue in the next chapter, located ethnography at the intersection of these previously opposed discourses. Ethnography is then commodified via the language of cultural tourism, thinly dressed up in the semantics of ‘conservation’ and ‘development’. This particular language of conservation is embedded in the mystique of ‘priest-craft’ and indigenous knowledge, and is evoked for ‘scientific’ and development purposes. Claims made in the late 1990s, by researchers on the validity of ‘ancient indigenous knowledge’ in relation to ‘science’, however, blur the previous separation of the Western Same and the anthropological Other. The new ethnospiritual/ecoscience integrates the mystical, the empirical and the theoretical. These intersect within a meta-discourse of a global fraction of capital, that of eco-tourism. ‘Man’ – that is to say, some ‘men’ – e.g. the ‘Bushmen’ – are ontologically rejoined with ‘nature’, which has now become a ‘scientific’ pursuit in the interests of cultural tourism. … science has a vested interest in the Bushmen, for, as Trefor Jenkins said, from the vantage point of science, the Bushmen are ‘southern Africa’s model people’ (Jenkins 1979: 280). Whereas filmmakers and journalists were the Bushmen image makers par excellence, it was scientific research that lent credibility to their enterprise.